John England was last seen heading back into the depths of the crippled USS Oklahoma to rescue a fourth shipmate on Dec. 7, 1941. The 20-year-old ensign had come topside after an order to abandon ship, then returned to the radio room three times to guide other sailors to safety even as the ship was capsizing. Ultimately, 429 sailors and Marines – including England – went down with their vessel minutes after it was struck by a barrage of Japanese torpedoes. Oklahoma’s losses were second only to USS Arizona on that day of infamy. Sorrow is all they would ever know. For more than 70 years, the family learned nothing more about England’s fate, including the fact that forensic experts identified partial remains of him and 26 other Oklahoma sailors in the late 1940s, then reburied them in an unmarked grave at the National Memorial Cemetery of the Pacific in Honolulu. England’s disappearance eventually splintered his family. His distraught widow cut ties with his parents. England’s daughter refused to speak of her biological father to her own children other than a vague reference to him being a Pearl Harbor hero – unavoidable in light of the fact that the Navy named two ships after him. Lifelong dream England grew up wanting to serve on Oklahoma. As a young boy, J.C., as he was known, gathered the kids in his Oklahoma City neighborhood to launch a model of the battleship on a nearby pond. He moved to California with his family after eighth grade and became a standout at Alhambra High School, where he served as senior class president and swept more than one sweetheart off her feet. “His dance card was always full,” says Glenn, who eventually tracked down his high school classmates. England met Helen at Pasadena Junior College and they eloped in January 1941. He received his Naval Reserve commission after earning his associate degree and sailed for Hawaii Oct. 3, 1941 – his pregnant wife’s 19th birthday. Their daughter, Vickie Lou, was born a month later and Helen made plans for them to join England after Christmas. Missing Oklahoma was anchored next to USS Maryland along Battleship Row when the Japanese attacked on that sleepy Sunday morning in 1941. 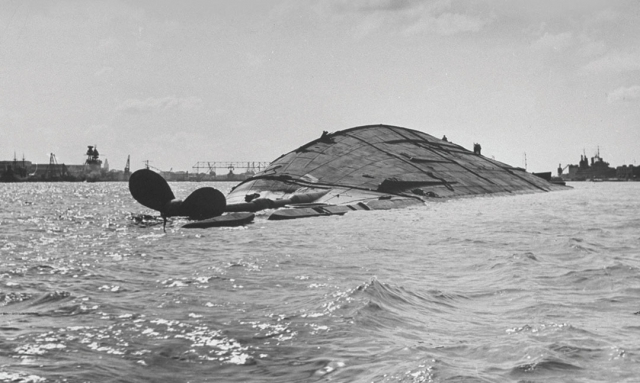 The ship capsized 12 minutes after the first of several torpedoes ripped into its port side. A rescue team cut holes in the hull of the overturned ship and rescued 32 men. Thirty-five bodies were subsequently recovered and identified. Nearly 400 others were still missing. The Navy righted Oklahoma and removed all the remains it could find beginning in July 1942. There were stories of fuel- and-oil-soaked bones stacked on the deck as the military cleared the holds, says Bob Valley, whose older brother, Lowell, was working in the port engine room when the Japanese began pummeling the ship. Those jumbled remains were buried in graves in two Honolulu cemeteries. After World War II, the American Graves Registry Service disinterred the Pearl Harbor casualties and took them to a laboratory at Schofield Barracks with plans to identify skulls, femurs, hip bones and the like, and return them to the next of kin. The task proved daunting in an era when DNA wasn’t even a concept. Nonetheless, the Schofield laboratory team proposed identifications for 27 Oklahoma sailors – including England – based on comparisons of military dental records with teeth found among the remains, says Heather Harris, a historian with the Defense POW/MIA Accounting Agency. Because they were unable to identify complete skeletons, the government quietly decided to bury the partial remains of the 27 in the National Memorial Cemetery of the Pacific – called the Punchbowl – and declare the casualties unidentifiable. England and nearly 400 of his shipmates were placed in 46 gravesites marked “Oklahoma unknowns.” It became the single largest group of unidentified casualties from the Pearl Harbor attack. And England’s family, like all the other families, was never informed. Adrift A month after her husband was lost at Pearl Harbor, Helen England’s San Francisco apartment building burned, adding to a string of tragedies. Her mother had died when she was 12, her father when she was 16 and now her husband when she was 19. She left her infant daughter with her in-laws and drifted east. Two years later, Helen married an heir to a prominent family she met while modeling in the New York City area. Once her new husband’s family discovered Helen had a daughter, they demanded she bring Vickie Lou to the East Coast and allow her to be adopted by their family to avoid the appearance of scandal, Glenn says. Vickie Lou wasn’t told about her real father, nor did she meet England’s parents until the 1960s. Heartbroken at the loss of their granddaughter, England’s parents focused on USS England, which was christened by Thelma in 1943 and set a record for sinking six Japanese submarines in a 12-day period in May 1944. A second USS England launched in 1962. Vickie Lou died in 2002. Two years later, Glenn’s cousin discovered a couple of boxes marked “J.C.’s stuff” while cleaning out her own father’s attic. She shipped the boxes to Glenn, who found everything from England’s high school yearbook to years of correspondence between his mother and two of his former girlfriends. Glenn subsequently learned that her grandfather’s death sent “a ripple of sadness” through his high school class. She also learned that her grandfather had been so well regarded, his high school had created the John C. England Award, the top honor given to a graduating senior. The biggest discovery was yet to come. Emory also compiled lists of all the Pearl Harbor casualties by ship, along with their medical records, and started pushing DoD to identify the unknown sailors. In the course of his work, he discovered records of the 27 Oklahoma sailors whose skulls and jawbones had been identified – and then reburied. That led to disinterment of a grave containing five of the 27 in 2003.
samples from family members, and new practices and policies for dealing with large groups of commingled remains before it moved forward. Emory, Valley and families of other men who perished on Oklahoma came together to lobby Congress, DoD and every office that had anything to do with military remains. “They were fully engaged and committed to seeing the rest of the Oklahoma unknowns disinterred,” Harris says. The Navy eventually hired a forensic genealogist to gather DNA samples from the Oklahoma families, Harris says. More than 80 percent of the families who lost a loved one on the ship came through. Gerald Lehman, one of the first five sailors exhumed in 2003, was identified with the help of a DNA sample gleaned from the seal of an envelope that carried a letter home to his mother. The email Glenn received an email from Bob Valley in 2008, after Emory recruited him to help locate the first group of Oklahoma families. She provided a DNA sample, as did her sister and her cousin, Katy Bemiss. Then Glenn and her cousin visited the grave where her grandfather’s partial remains were said to be buried, wondering if he would ever come home. girlfriends that they were thinking of leaving him in Hawaii with his shipmates. “(She) burst into tears and said, ‘Please bring him home.’ She urged me to see if we could bury him with his parents in Colorado Springs.” They discovered that England’s parents had purchased a plot next to their own, complete with a headstone, in the event their son was eventually found. In June, the Navy visited Glenn, told her that they had identified England’s skull, and gave her the option of waiting until all of his remains were found to bring him home. Her family didn’t want to wait. England’s partial remains were flown to Colorado Springs in August. During a private moment at the funeral home before he was buried with full military honors, Glenn and her sister tucked their mother’s ashes into the casket, finally bringing father and daughter together in a gesture of peace.